When you’ve spent all day sitting in a tree stand or carefully stalking through the woods, the last thing you want is to lose that gorgeous trophy buck due to either inferior ammunition or lack of practice. Getting a clean kill is all about shot placement, and you’re not going to have sufficient accuracy and good shot placement unless you’re spending time firing your shotgun outside of hunting season. All too many hunters don’t even touch their guns unless it’s deer season, and that’s not the best way to do things. If you want to fill your deer tag and bag that 12-point buck you’ve been eyeing on the trail cameras, you need to order a big box of ammo and get to work. 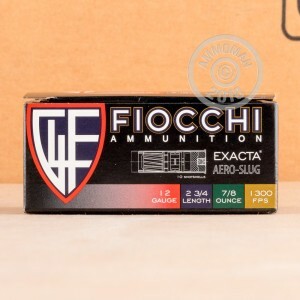 These 12 gauge rounds are made by the renowned Fiocchi Ammunition company. Each shell is 2 ¾” long and contains a 7/8 ounce rifled slug. These rounds reach out and touch your target with a muzzle velocity of 1300 feet per second and impact with phenomenal energy and knockdown power. They’re a favorite of many deer hunters, and for good reason: when you’re hunting you want to make a clean kill, and with good quality slugs such as these you can get it, all you need supply is the shot placement. Each of these shells also contains the Fiocchi Aero Wad which is designed to improve aerodynamics, especially at longer ranges. 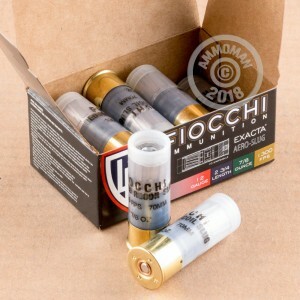 You get 250 shotgun shells in this box of ammunition from Fiocchi. With that many rounds you can spend some serious time honing your accuracy and shot placement and still have some left over for the hunt itself. Without sufficient range time you’ll never be a skilled hunter, and in order to get that range time you need ammunition, so place your order right now, and become the hunter you’ve always wanted to be. Fiocchi has been in business since 1876 and is based in Lecco, Italy. For United States distribution the venerable company has a facility located in Ozark, Missouri. Don’t wait another second to improve your season; order now.